They walk these sinister streets, making sure its citizens are safe from harm. They are not out for gratitude, merely the money that comes from tourists taking pictures with them. 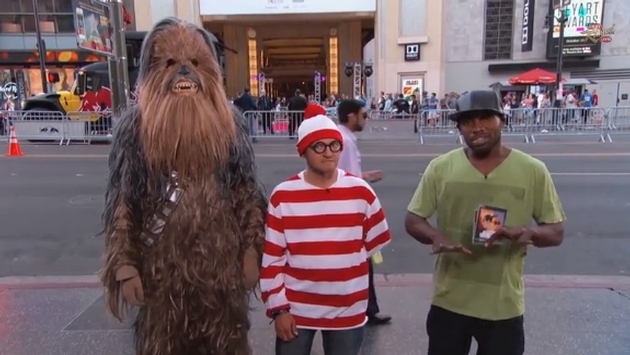 They are Chewbacca, Waldo and new sidekick R.J., and they are the heroes we need. On Tuesday, a fight broke out on Los Angeles’ Hollywood Blvd. outside the TLC Chinese Theatre between Mr. Incredible and Catwoman, leading to Chewbacca and Waldo stepping in to quell the madness. Contrary to your belief, the names of the characters have not been changed to protect the innocent. That’s pretty much all the reporting you need, fresh from the mouth of the warrior from Kashyyyk who has been working on his human accent, the well-traveled man who wears the same thing every day of his life and a local musician who believes people still use CD players. 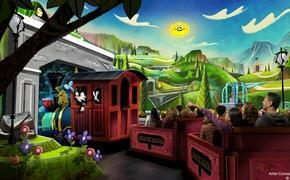 However, KTLA did cover the incident that took place amid locals and throngs of presumed tourists. Unfortunately, the report also reads like some crazed multiverse, comic crossover series. We still don’t know what caused the fight or what happened to the elusive Mr. Incredible. The only thing we can say for certainty is that he should be forever branded Mr. Horrible for body slamming a female colleague. We certainly hope she is doing fine. Now we do have to offer there are plenty of fantastic places in Los Angeles, offering unforgettable experiences and prime locations to snap off photographs. However, if you are in the market for a cluster fudge of people, crazy and otherwise, leading to an underwhelming adventure, Hollywood Blvd. is your place. And don’t worry about crime, because Chewie and Waldo are on the job. They may look befuddled, but that’s just because they are.